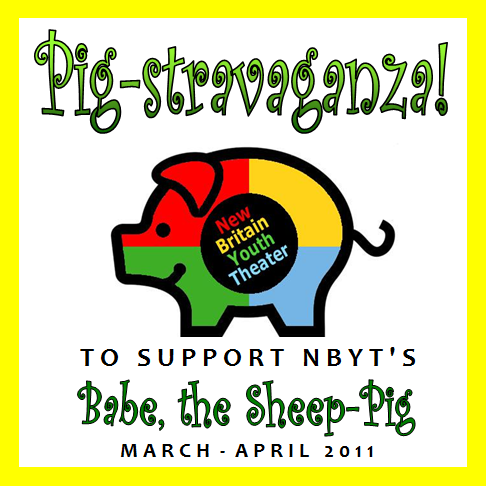 This spring, New Britain Youth Theater will hold a Pig-stravaganza Art Show & Auction! What exactly is a Pig-stravaganza? This piggy-bank-painting event and auction has three goals: to help promote NBYT’s spring production of Babe, the Sheep-Pig, to raise funds for NBYT programming, and to help celebrate the first birthday of NBYT! To reach these goals, NBYT is enlisting the help of the community, other artists, local businesses and organizations, and children and their families. Area merchants and organizations can sponsor and display artist-designed piggy banks from mid-March through April 30; sponsors will be recognized in promotional materials and advertising and will receive tickets to Babe, the Sheep-Pig. Artists and designers can paint or decorate a piggy bank and have their work displayed (at the Downtown Visitors Center and Gallery, among other locations) and auctioned to support NBYT; artists will also be listed in promotional materials and receive tickets to Babe, the Sheep-Pig. There is no cost for artists to participate and piggy banks are provided free of charge. Celebrities will be invited to sign, decorate or paint piggy banks for auction. Piggy banks will be auctioned at Trinity-on-Main Performance Center on Saturday, April 30, at an event before the first performance of Babe, the Sheep-Pig. 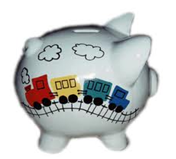 Children involved in NBYT programs will also be given a chance to decorate a piggy bank of their own to keep; these will be displayed in the lobby of Trinity-on-Main during the run of Babe, the Sheep Pig from April 29 through May 1. We’re hoping to receive much community support and to draw attention to other New Britain businesses, organizations and nonprofits as well as NBYT! For more information on how to paint or decorate a piggy bank (whether you’re a professional or amateur artist or designer) or how to support or be part of NBYT’s Pig-stravaganza! call 860-515-8115. We’ll be adding lists of artists and event sponsors as they come in! Previous Previous post: BABE, THE SHEEP-PIG auditions!